The Honda Civic Sedan comes in a wide variety of configurations for the 2017 model year. The base model is the Honda Civic LX. This is the most affordable version of the Honda Civic, and it is far from stripped down. In fact, it offers many features that are not standard in competitors’ base model sedans. Find out more about the Honda Civic LX here at Brilliance Honda of Crystal Lake! 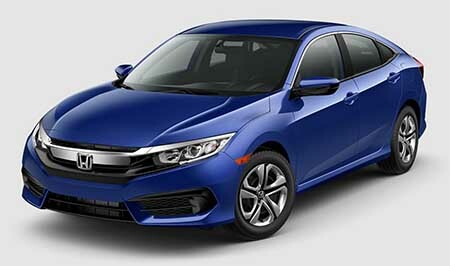 Every Honda Civic gets a rearview camera, traction and stability control, and four-wheel anti-lock brakes with brake force distribution and brake assist. The Civic LX can even be upgraded with the Honda Sensing System that adds features like a lane departure warning system, lane departure prevention, forward collision warning, and forward collision prevention. Let us help you find the right Honda Civic for your needs here at Brilliance Honda of Crystal Lake, your local Elgin and Chicagoland area Honda dealership. We’re located at 680 W. Terra Cotta Ave. in Crystal Lake, IL, and we’ve got the current Civic LX in stock, as well as a fine selection of high-quality used Honda Civic LX models. Stop by today to take benefit of our years of experience.